3 Different Bullen Ginger Beer Bottles All Made By Pearson's Of Chesterfield Bourne Denby Made Ginger Beer Bottles Printed "Brewed J. Bullen Wells, Next-The-Sea Ginger Beer"
Two Tone Champagne Ginger Beer Bottle Printed "Bullen Brothers Park Road Wells Norfolk" Made By Price of Bristol All White Price Of Bristol Made Ginger Beer Bottle Printed "Brewed Ginger Beer J. Bullen Wells Next-The-Sea"
Two Tone Water Jug Made By Price Of Bristol Printed "Aerated Waters J. Bullen Wells Norfolk And High Class Beverages" Wooden Codd Opener Stamped "Bullen's"
Black Glass Half Pint Beer Bottle Embossed "J. Bullen Standard Mineral Water Works Wells Norfolk" Large & Small Hamilton Bottles Embossed "J. Bullen Standard Mineral Water Works Wells Norfolk"
Stretched Seltzer Bottle Embossed "J. Bullen Standard Mineral Water Works Wells Norfolk" 6 & 10oz Codd Bottles Embossed "Bullen Brothers Park Road Mineral Water Works Wells Norfolk"
Soda Syphon Embossed "J. Bullen Standard Mineral Water Works Wells Norfolk" Soda Syphon Embossed "Bullen Brothers Park Road Mineral Water Works Wells Norfolk"
Soda Syphon Embossed "J. Bullen Standard Mineral Water Works Wells Norfolk" Soda Syphon Embossed "J. Bullen Standard Mineral Water Works Wells Norfolk"
2 Crown Cap Ginger Beer Bottles Embossed Round Base "J. Bullen Wells Norfolk" 3 Crown Cap Bottles Embossed "J. Bullen Wells Norfolk"
Joseph Bullen is listed from 1904 until 1933 at Standard Road Wells as a mineral water manufacturer but in 1925 Robert Claxton is listed as a mineral water manufacturer (Late Bullen Bros.). There is no directory entry for Bullen Bros so it seems they traded for a very short time between 1922 and 1925. Robert Claxton continues to be listed until the 60's. Two Tone Flagon Printed "Herbt Cawdron Wine & Spirit Merchant Wells Next The Sea" Two Tone Flagon Impressed "Herbt Cawdron Wine & Spirit Merchant Wells-Next-Sea"
3 Beer Bottles Embossed "Herbert Cawdron Wells & Wymondham" One And Half pint Beer Bottles Embossed "Herbert Cawdron The Globe Stores Wells Next The Sea"
Beer Bottles Embossed "Herbert Cawdron The Globe Stores Wells Next The Sea" One And Half pint Beer Bottles Embossed "Herbert Cawdron The Globe Stores Wells Next The Sea"
Pair of Whiskey Flasks Embossed "Herbert Cawdron Wine Merchant Wells & Fakenham" Pair of Whiskey Flasks Embossed "Herbert Cawdron The Globe Stores Wells Next The Sea"
Fired On Label Beer Bottles Which Read "Cawdron's Of Fakenham & Wells" Beer Bottles Embossed "Herbert Cawdron Wells & Fakenham"
Wooden Crate Which Reads "Peatling & Cawdron" Wooden Crate Which Reads "Cawdrons Fakenham & Wells"
Herbert Cawdron is first listed at Wells in 1896 and 1900 as an assistant overseer, newspaper reporter and advertisement agent at Station Road. 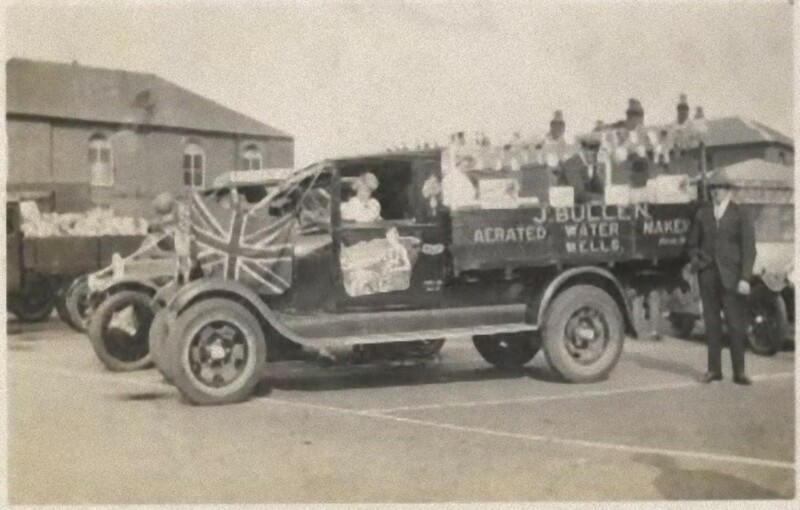 In 1904 he is listed as a wholesale wine and spirit merchant in the Globe stores, Buttlands. 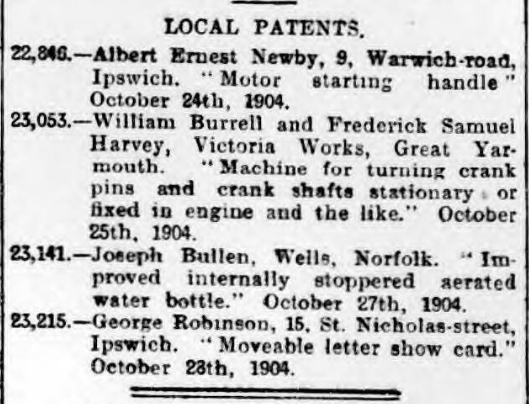 In 1908 he is listed as having stores at Wymondham called the Burton Stores and was also an Ammunition dealer in Wells. 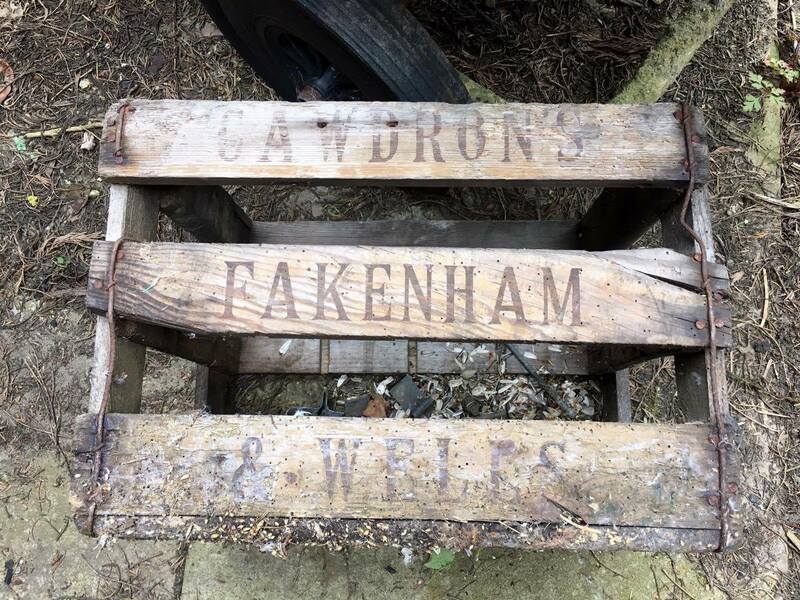 By 1922 he had taken over Davis Brothers at Fakenham in the Vine Stores. Herbert Cawdron continues to be listed at Wells beyond 1932 but eventually merges with Thomas Peatling of Wisbech to from Peatling & Cawdron. 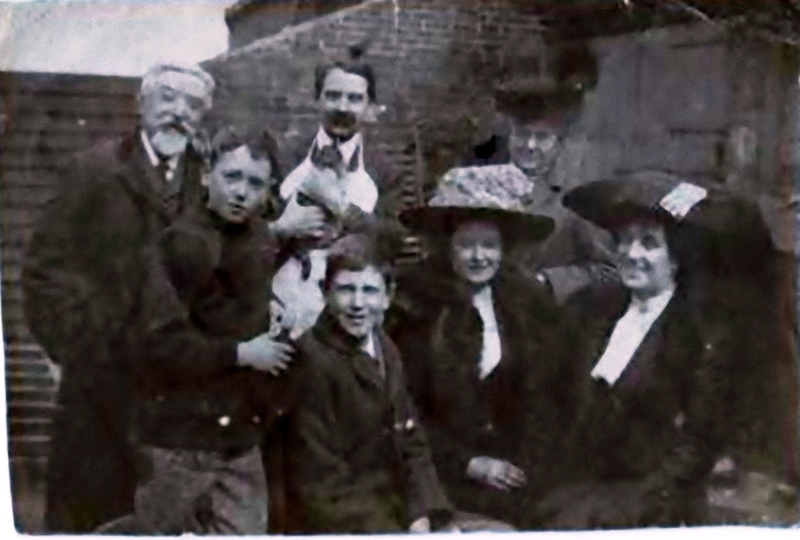 Walter Chapman is listed as a Chemist at Staithe Street Wells from 1912 until 1922 and was taken over by James Cyril Kinghorn. Ginger Beer Bottles Made by Skey of Tamworth Printed "Robert Claxton Park Road Works Wells Norfolk" Ginger Beer Bottles Made by Price of Bristol Printed "Robert Claxton Park Road Works Wells Norfolk"
Soda Syphon Etched "R.Claxton Wells Norfolk" Soda Syphon Etched "Robert Claxton Park Road Mineral Water Works Wells Norfolk"
Crown Cap Ginger Beer Bottles Embossed On The Left "Claxton Wells Norfolk" The Right "R. Claxton Wells Norfolk" Codd Bottles Embossed "Robert Claxton Park Road Mineral Water Works Wells Norfolk"
Wooden Crate Which Reads "Robert Claxton Park Road Mineral Water Works Wells Norfolk" Crown Cap Pop Bottles Embossed "Claxton Wells Norfolk"
Claxton's Mineral Water Works, Wells-Next-The-Sea. Saltglazed Ginger Beer Bottle Impressed Round Shoulder "S.A. Cook"
Glass Whiskey Flask Etched Crown & Edinburgh Wells"
Two Tone Flagon Impressed "J. 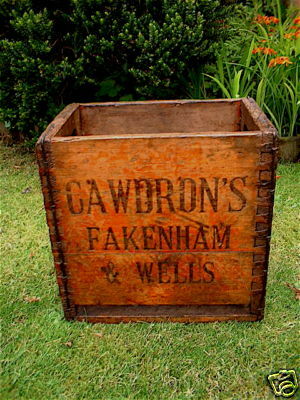 A. Davidson Wine & Spirit Merchant Wells" Two Tone Flagon Impressed "J. 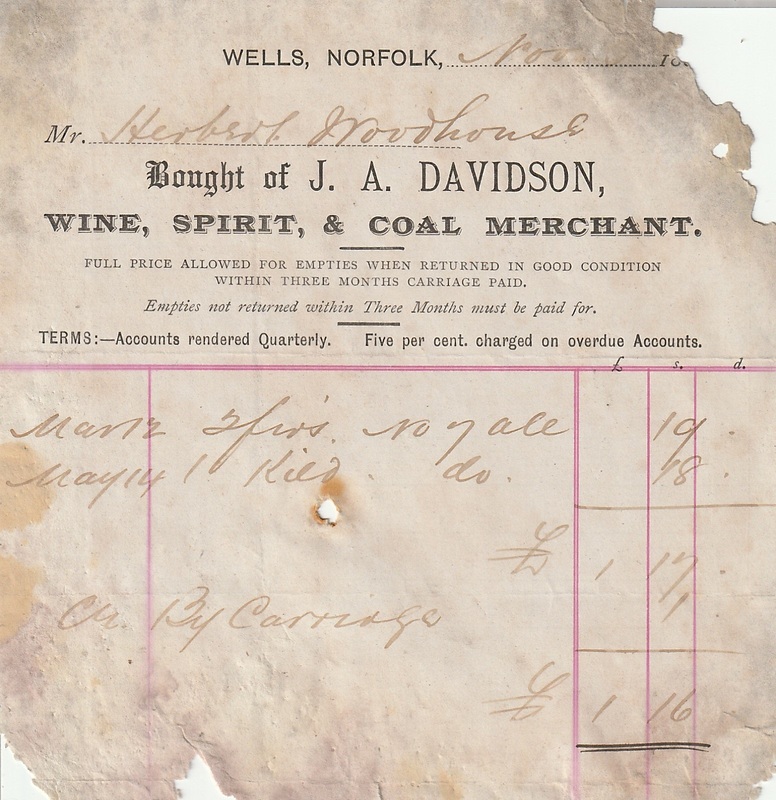 A. Davidson Wine & Spirit Merchant Wells"
Two Tone Flagon Impressed "Davidson & Glazebrook Wine Merchants Wells Norfolk"
James Alexander Davidson is first listed in 1879 as a Wine and spirit merchant and ale and porter merchant at Staithe Street and also a coal merchant on the Quay. In 1888 he is listed as being in the "Edinburgh" but by 1896 he was Listed as being in the "Crown" and also as a coal and cartridge manufacturer. 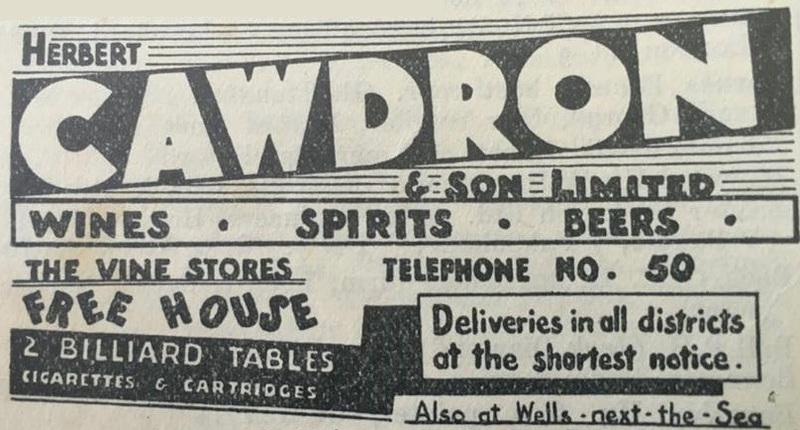 In 1904 he joins with William Oxley Glazebrook to form Davidson and Glazebrook who ran the "Fleece" and also wine and spirit merchants in the High Street. by 1912 they had been taken over by Beatrice Fysh. 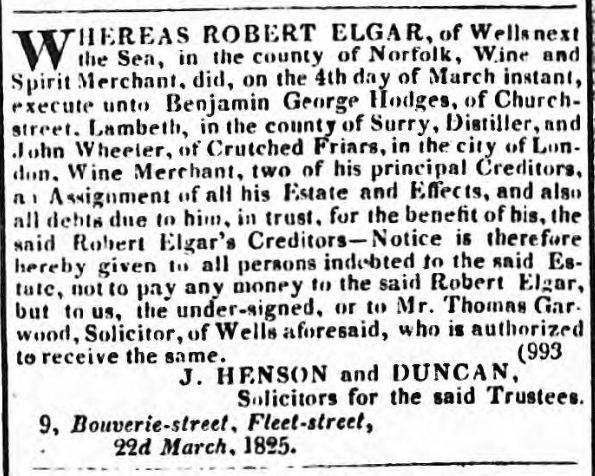 Robert Elgar is listed from 1822 until 1830 as a wine and spirit merchant and Porter Merchant at Three Tuns Yard. Wells. Two Tone Flagon Impressed "B. Fysh Wine Merchant Wells Norfolk"
Beatrice Fysh took over from Davidson and Glazebrook between 1908 and 1912. She was last listed in 1916 as a Wine and Spirit Merchant at The Edinburgh Stores. Two Tone Flagon Impressed "O.W. 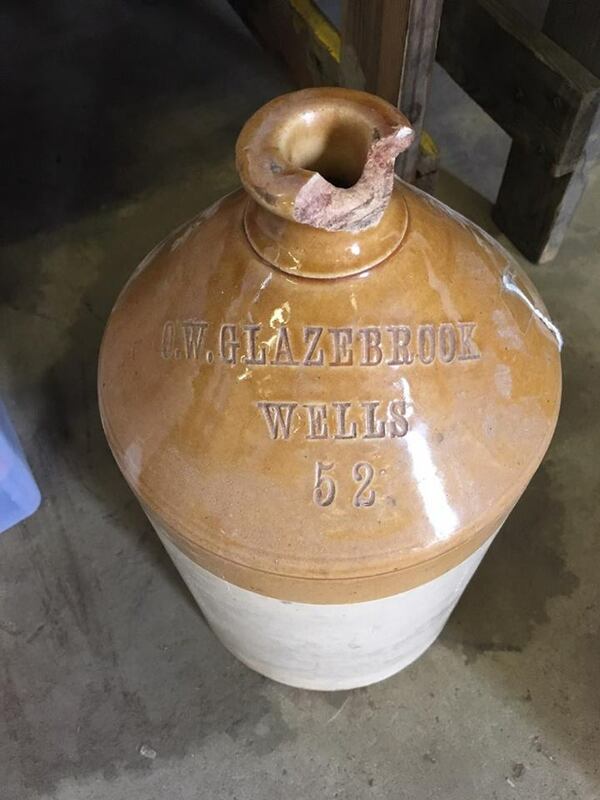 Glazebrook Wine & Spirit Merchant Wells" Two Tone Flagon Impressed "O.W. Glazebrook Wine & Spirit Merchant Wells"
Two Tone Flagon Impressed "Davidson & Glazebrook Wine Merchants Wells Norfolk" Two Tone Flagon Impressed "O.W. Glazebrook Wells"
Oxley William Glazebrook is first listed in 1900 as a Wine and Spirit Merchant and Beer Bottler in the High Street. 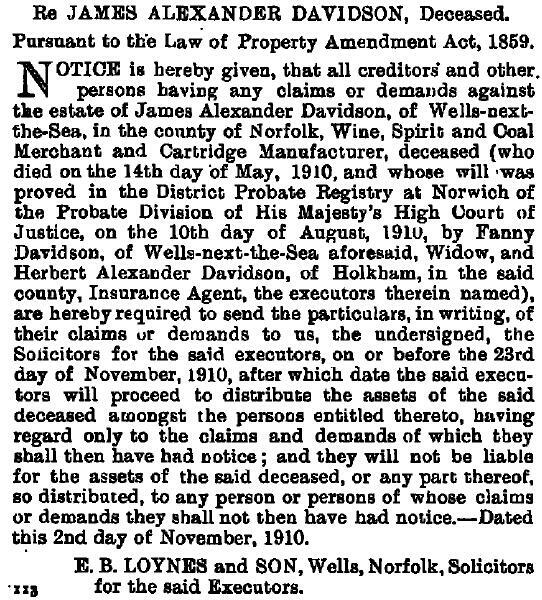 By 1904 He had joined with James Alexander Davidson to form Davidson & Glazebrook. Davidson & Glazebrook were listed from 1904 until 1908 at "The Fleece" Quay and also Wine and Spirit Merchants in the High Street. By 1912 They had been taken over by Beatrice Fysh. 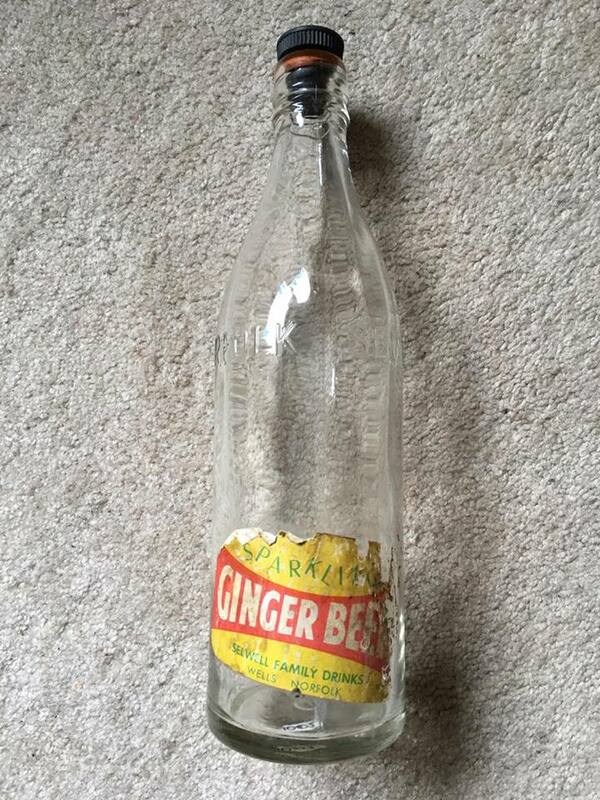 Slipglazed Ginger Beer Bottle Impressed "W. Lynn Wells"
W. Lynn was listed at Wells as a soda water manufacturer from 1875 until 1888 in Freeman St. 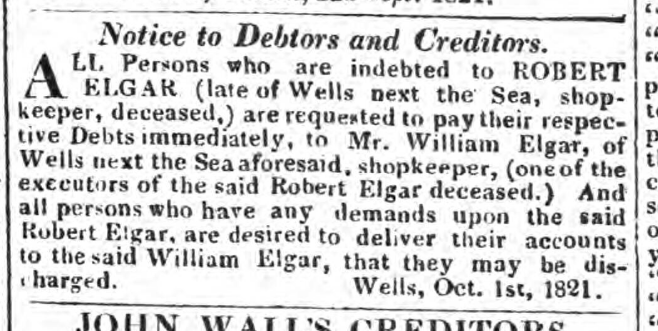 He was also a hairdresser in Wells from 1854. Saltglazed Flagon Impressed "J.S. Southgate Wells" Saltglazed Flagon Impressed "J.S. 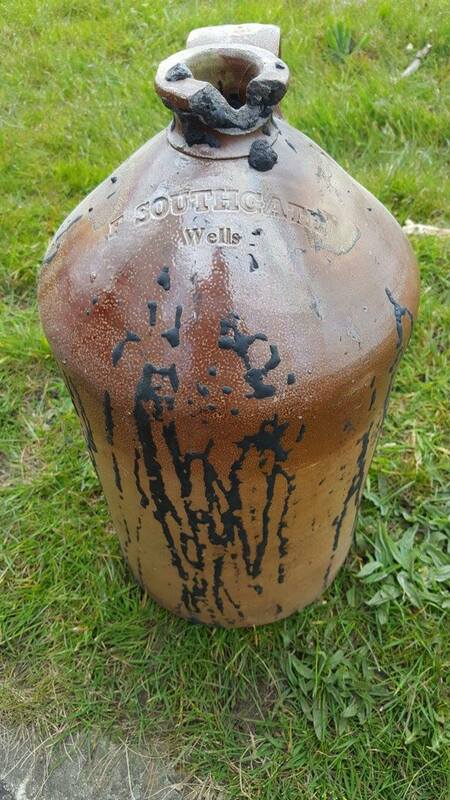 Southgate Wells"
Saltglazed Flagon Impressed "F. Southgate Wells" Two Tone Flagon Impressed "Francis Southgate Wells"
Joseph Springall Southgate is first listed between 1822 and 1936 as a coal and corn merchant at the Quay and by 1839 at the Buttlands. 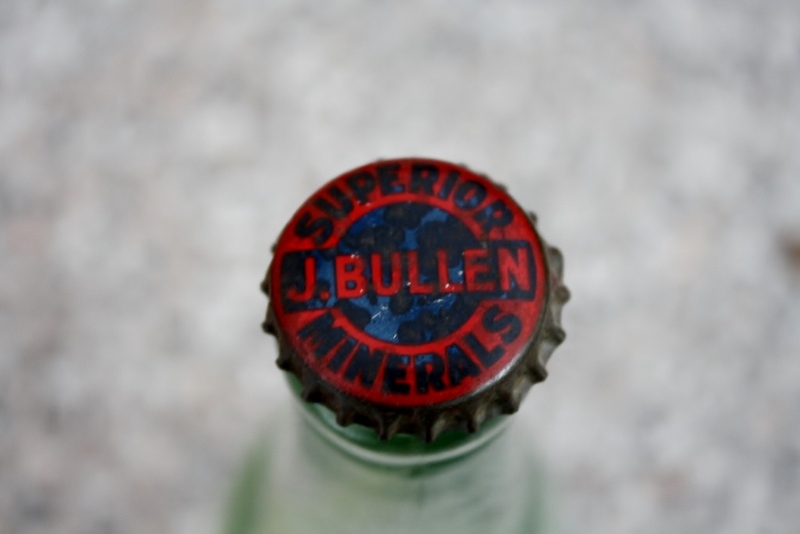 In 1845 he is first listed as a brewer and porter merchant and also wine and spirit merchant. 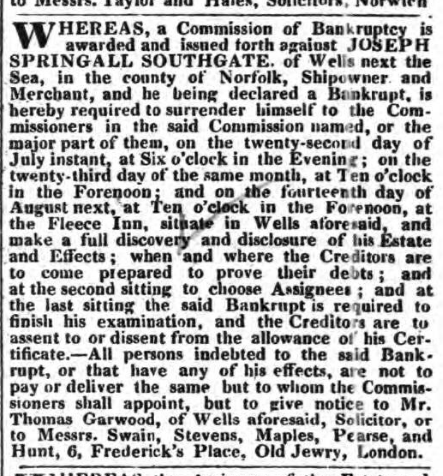 By 1850 Francis Southgate had taken over and continued to be listed as a wine and spirit merchant at the Buttlands until 1890. 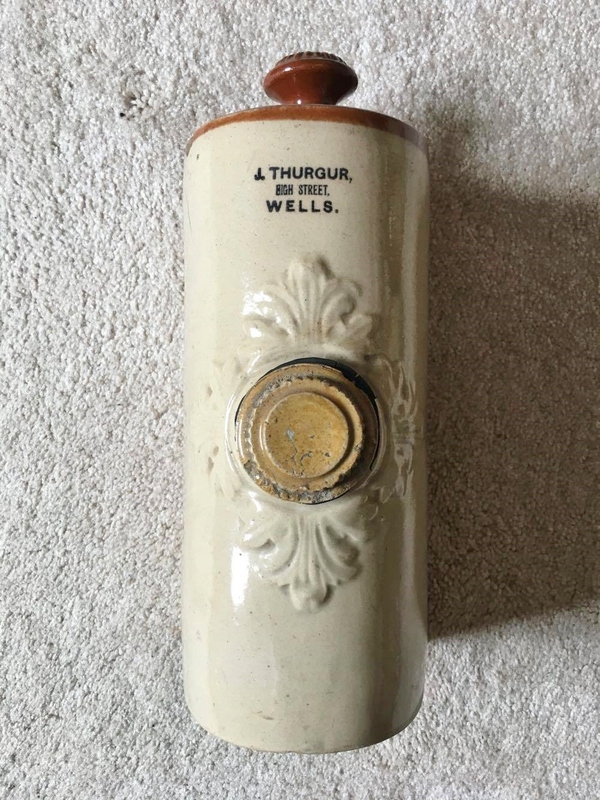 William Frederick Thurgur was first listed in 1858 a Earthenware dealer at the High Street. 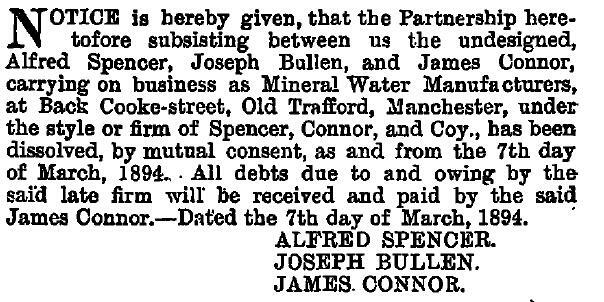 He continues to be listed as an Earthenware Dealer and also Ironmonger and Marine Store Dealer until 1890 when James Thurgur had taken over. 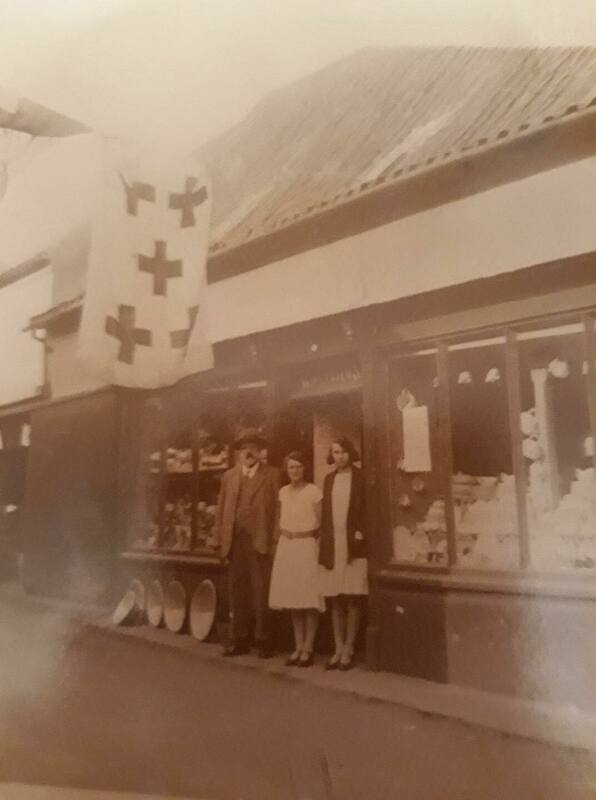 In 1892 as well as James Thurgur, Anna and Mary Ann Thurgur are listed as being Earthenware dealers at Staithe Street. 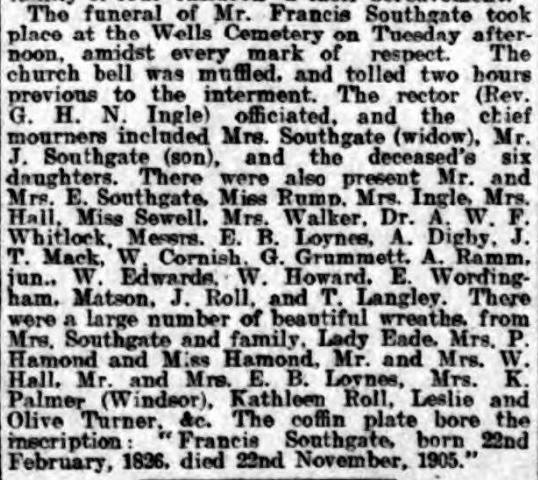 Both James Thurgur and Anna and Mary Ann continue to be listed until 1908. In the 1908 directory just James Thurgur is listed as a China and Marine Store Dealer at the High Street Address. By 1922 a William Thurgur is listed at 55 to 63 High Street as an China and Glass Dealer. William Thurgur continues to be listed beyond 1932. James Tyzack is first listed in Wells in 1830 as a Perfumer, Hairdresser and Patent Medicine Vendor at High Street, Wells. In 1839 He is listed as Perfumer to the Queen and also an Ink Manufacturer. 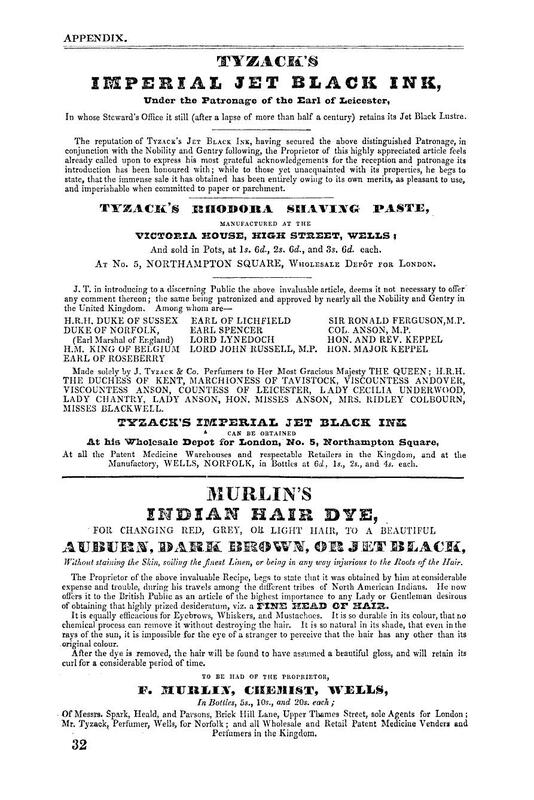 James Tyzack is last listed in 1858 as a Perfumer, Hairdresser and having the Fancy Repository. 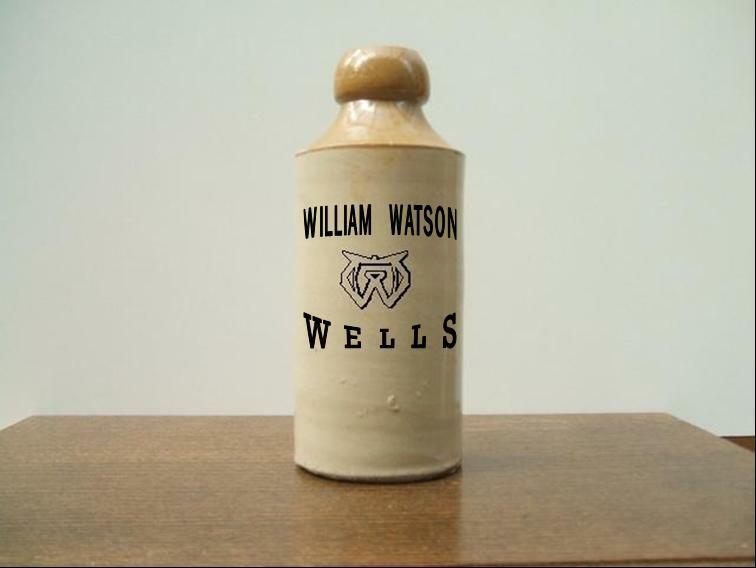 Two Tone Ginger Beer Bottle Printed "William Watson Wells"
William Watson was listed as a beer retailer in the Shipwrights Arms Between 1890 and 1900 and as a beer retailer in 1904 and 1908.